At least four anti-government protesters were killed and 47 were injured by security forces at a nationwide protest against Congo President Joseph Kabila. This protest was organized by Christian leaders, according to the United Nations. Leila Zerrougui, the head of Congo's U.N. mission, said Sunday that 47 people were injured and more than 100 were arrested across the country for participating in a protest organized by the Catholic Church and other church groups to call for the government to organize a long overdue presidential election. Slain activist was 36-years-old Rossy Mukendi, who is an assistant university professor shot by police outside of a church in Kinshasa's Lemba neighborhood. 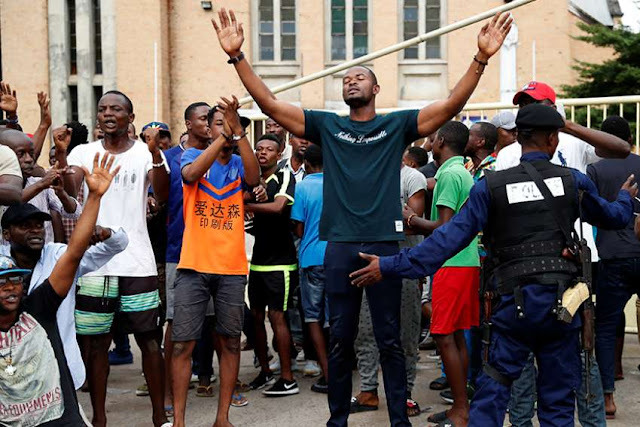 "Since 7:00 am we have received three injured people from the Catholic march," Dr. Francois Kajingulu from the St Joseph de Limete hospital told AFP. "Two were seriously injured and one died from a bullet wound in the chest." Kabila, who has been office since 2001, was the first president elected under these rules and his second term was to end in 2016. The organizers of Sunday's demonstration are calling for a new election. "Our people no longer believe in the political will of our current leaders to ensure a peaceful transition of power," the Lay Coordination Committee (CLC). In a statement the CLC said that "there will be no respite for the government in place as long as we have not recovered our dignity and our liberty." According to AFP, three priests were arrested for leading a march in east Kisangani. In Kisangani, hundreds marched but retreated into a Cathedral when police used tear gas and began firing bullets. Deutsche Welle news reported, government forces killed as many as 12 protesters in the previous two recent anti-Kabila demonstrations. Earlier this year, it was reported that security forces in Congo had fired bullets and used tear gas on protesters inside of churches. Eight Christians were killed and at least 82 were arrested.